It takes water to create electricity and electricity to treat water but the process is wildly inefficient and millions of gallons are wasted every year producing our power and treating our water. In fact it takes approximately 55 gallons of water to run your computer for a month, 73 gallons for your television. With the desire and accumulation of more and more technology devices, the demand for power is draining our water supply. 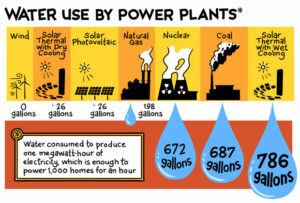 So saving electricity – saves water , and saving water- conserves power, which in turn, conserves water. This doesn’t even take into account items such as reduced carbon footprint, losses in treatment, transportation and evaporation of water, of the reduced drain on the existing power grid. There is indeed a cascading environmental effect with water conservation efforts. Turning off lights and shutting down computers at night is an essential step but we have to find more and better ways to conserve energy and save our precious water. For example, if just one percent of the homes in the United States with standard toilets used just ½ gallon less water with every flush, hundreds of millions of gallons of water would not need to be treated and over 38 billion kilowatts of electricity would be saved every year. 1 gallons of water weighs 8 pounds, we use 100 gallons per day, which is 800 pounds or the weight of a small cow!